Police Arrest Dozens In Ferguson, Mo., Protests : The Two-Way At least 49 were arrested Monday afternoon and into the evening for acts of civil disobedience during protests over the August police shooting death of 18-year-old Michael Brown. An unidentified man is taken into custody Monday after performing an act of civil disobedience at the Ferguson, Mo., police station. 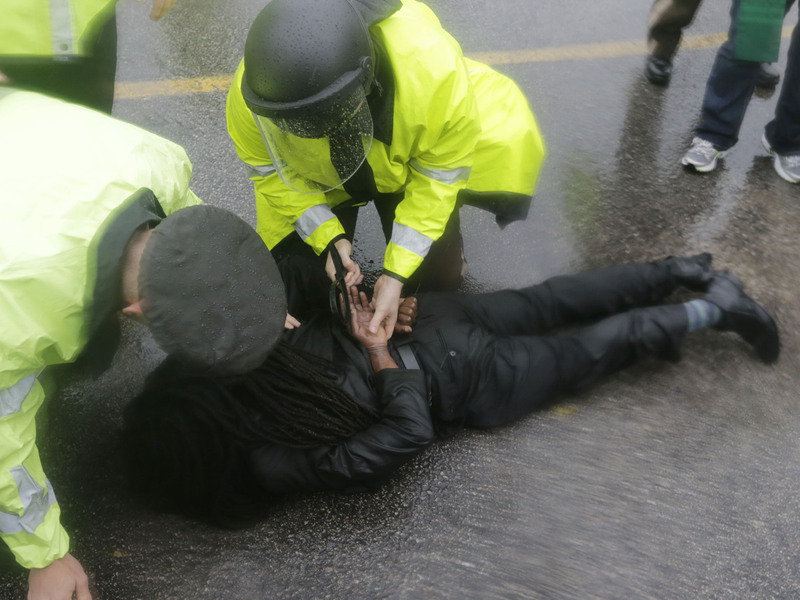 About 50 were arrested during protests over the police shooting of Michael Brown in August. Amid rain showers and a tornado watch, police in Ferguson, Mo., made dozens of arrests Monday afternoon and into the evening of people who had gathered to protest the fatal shooting of Michael Brown, the black 18-year-old who was killed by a white police officer in August. St. Louis Public Radio reports: "Police began [the arrests of demonstrators] — many of them clergy members — around 12 p.m. At least some of them were charged with peace disturbance, a misdemeanor offense according to state law." By official counts, it appeared that 49 people had been arrested for acts of civil disobedience, but The Associated Press put the figure at "more than 50" on a day that demonstrators dubbed "Moral Monday." The St. Louis Post Dispatch says 43 of those taken into custody "had offered themselves for arrest outside the police station." "The events Monday included a march led by clergy to the Ferguson Police Department, a 'dead-in' at Washington University in St. Louis and a demonstration at St. Louis City Hall. "As of 7:30 p.m., police had taken 49 people into custody, including visiting civil rights activist and professor Cornel West and the Rev. Osagyefo Sekou." "About 500 people took part in the protest outside the police station, which began before 11 a.m. and ended shortly after 2 p.m.
"Two miles away, six more protesters were arrested in the intersection of West Florissant Avenue and Lucas & Hunt Road, where they had been blocking traffic by holding up a sign. They had been part of a separate demonstration that began about a block away, at the entrance to the Emerson Electric Co. world headquarters. Watched by officers, the demonstrators never ventured onto Emerson property." "Some protesters used a bullhorn to read the names of people killed by police nationwide. Christian, Jewish and Muslim clergy members — some of whom were among the first arrested — led a prayer service before marching to the police station two blocks away. "Protests have been common since Brown, who was unarmed, was killed by Darren Wilson on Aug. 9. Tensions escalated last week when a white police officer in St. Louis fatally shot another black 18-year-old, Vonderrit Myers Jr., who police say fired the first shots."